After the French campaign the RAF prepared for the coming Battle of Britain in which the Luftwaffe intended to achieve air superiority. 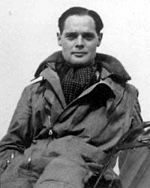 : /ˈbɑːdər/) CBE DSO & Bar DFC & Bar FRAeS DL (21 February 1910 – 5 September 1982) was a Royal Air Force (RAF) fighter ace during the Second World War. He then took part in the Battle of Britain and became a friend and supporter of Air Vice-Marshal Trafford Leigh-Mallory and his "Big Wing" experiments. Soon afterward he met and befriended Adolf Galland a prominent German fighter ace.